More and more organizations are taking advantage of the benefits a globally-distributed workforce can provide. Although dispersed teams promise substantial growth opportunities and a reduction in overhead costs, managing them can be problematic. The secret to success is in understanding the differences you’re likely to encounter when managing teams across borders, cultures, and time zones. 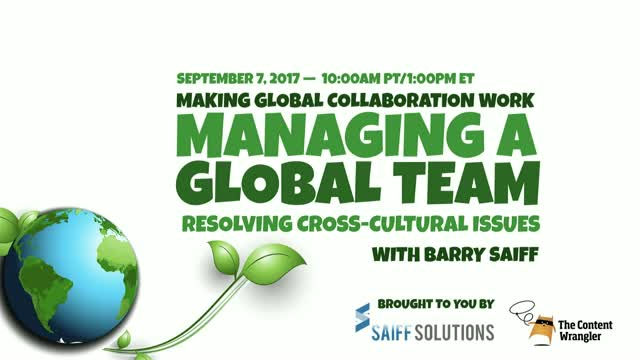 Join me, Scott Abel, The Content Wrangler, and my special guest, Barry Saiff, CEO of Saiff Solutions, for a free one-hour webinar on resolving the most common cross-cultural team management challenges. In this session, using real-life examples, you’ll learn how to address global cultural differences in the way people deal with conflict, relate to authority, ask and answer questions, express respect, and practice equality in the workplace. You’ll hear useful advice—gathered from our own experience managing a global team that spans North America, Asia, and Europe. You’ll leave knowing what you need to do to succeed.